Life and Times of Alex Esguerra: The Slogan, "Making America Great Again"
The Slogan, "Making America Great Again"
From Wikipedia, the free encyclopedia A "Let's Make America Great Again" pin button from Ronald Reagan's 1980 presidential campaign Donald Trump wearing a Make America Great Again hat in 2016. 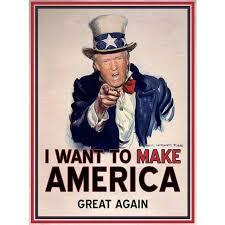 "Make America Great Again" is a campaign slogan used in American politics that originated with the Ronald Reagan campaign of 1980. Donald Trump subsequently received a U.S. Service Mark..
Reading through www.greatagain.gov, the incoming Trump administration focuses heavily on Regulatory reform as cornerstone of the Trump Administration, and the effort will include a temporary moratorium on all new regulation, canceling overarching executive orders and a thorough review to identify and eliminate unnecessary regulations that kill jobs and bloat government. This reminds me a few years ago about the outsourcing of jobs during the Bush administration like call centers being routed to third world countries. As everything nowadays talks about the then Billionaire Mr. Trump cons and pros which might either make America great or worse we don't really know. What we do know that each person has their own style and business entrepreneurship ideas might be an essential tool on regulatory analysis of the impediments to job creation. The only difference having seen both sides of regulation and moratorium that not all the greatest entrepreneurial approaches to the global mighty economist might work. Why? It's simply because running a business is entirely much easier to control and manage the outcomes that political governance where even the greatest strategist cannot really conclude if the strategy will work 100%. Thus, back in the days when there was was an enormous doors being open for me from the business socio-civic endeavours to moved to the political arena, I made the decision to simply stay as a private citizen engaged in community and public service. There were the economist, the entrepreneur moguls in developing countries whom became president that history writes were thought to have done great strides yet who had the same balance of governance failures. Of course, the main difference in politics there's always the pointing game rather than if your a small business owner, then you and yourself is the only one to blame. Quoting from www.greatagain.gov " The regulatory bureaucracy is enormous and its impact on our economy, communities and individual Americans from coast to coast is even larger". With such underlying statement, can we really gauge outcomes on the first 100 days? It validates the complexity of governance yet the incoming administration talks about sensible regulations. When Barack Obama took the baton in 2008, it talks about the greatest recession in ages where stimulus had to be infused to the economy dealing with the stock market chaos, the auto industry, etc.., Yet as I've heard people from the midwest talking about why they needed a change for steel, plant workers and or the middle class which is why Pres. Donald Trump won in big numbers on these states. Looking at this arguments, brings my historical picture of what politics is about anywhere in the world. The bottom line as I've noted over and over through the years, what is there for "Mainstream America"? It's too early to pre-judged yet it's not too early to constantly watch the next steps and react in proper decorum. Civil rights, equality, and respect will be a good trend gauging arena as after all these were all the rhetoric focus on this election.